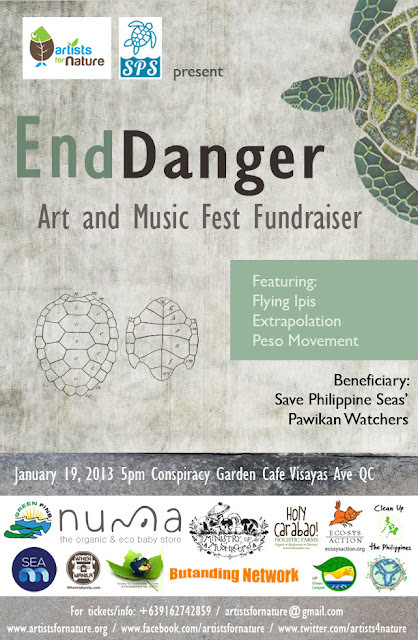 Artists for Nature and Save Philippine Seas (SPS) present: EndDanger, an eco art and music festival fundraiser for the benefit of SPS' Pawikan Watchers. There is undeniably a growing problem of endangerment to our ecosystem. Our forests and marine life are increasingly affected by habitat destruction, pollution and commercial exploitation. Many animal species are now in the brink of extinction. It's time to End the threats that pose Danger to Philippine animals. The event seeks to raise funds to help conserve, raise awareness and protect these endangered species. It will kickoff on January 19, 2013 with performances from Flying Ipis, Extrapolation, and Peso Movement at Conspiracy Garden Cafe. The highlight of the event is the mixed media artwork exhibit by Artists for Nature, which will be on display until Feb 8, 2013. Ticket price is P120, including 1 beer stub. Proceeds from ticket sales will go to SPS' Pawikan Watchers training program to strengthen the monitoring of the Philippines' most threatened species, the Pawikan (sea turtle). Save Philippine Seas (SPS) is an independent movement that fights abuse of our aquatic resources through legal discourse and social media. It runs in cooperation with Protected Areas and Wildlife Bureau (PAWB). Pawikan Watchers aims to educate volunteers from different parts of the Philippines on the ecology and biology of sea turtles (under PAWB-approved guidelines).